Leaf says that 2012 Leaf Ultimate Draft Football is their strongest gridiron prospect set of the year. With a low print run, loaded checklist and high-quality production, many collectors are likely to agree. 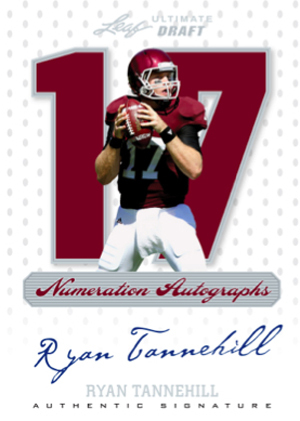 Sold in single-pack boxes, each promises three autograph cards of top prospects in the 2012 NFL Draft. These include the usual suspects like Robert Griffin, Trent Richardson, Ryan Tannehill, Justin Blackmon and LaMichael James. Leaf is limiting the size of the checklist to help make sure that only the most collectible players with the most potential are included. It is worth noting that Andrew Luck autographs are not in 2012 Leaf Ultimate Draft Football due to his exclusive deal with Press Pass. Base Leaf Ultimate Rookies have a handful of limited parallels that are numbered as low as 1/1. 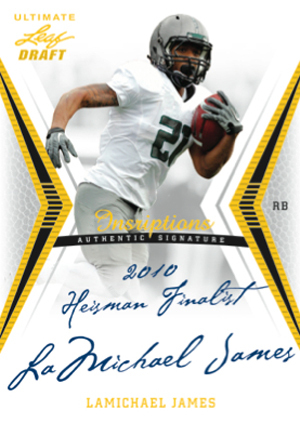 Besides the base autographs, 2012 Leaf Ultimate Draft Football has a handful of autographed inserts. Leaf Inscriptions has inscribed signatures with a variety of notes for collectors. Leaf TD Countdown is numbered to every player's touchdown total in their last year of college. Leaf Numeration uses the design introduced in 2011 Leaf Legends of Sport with cards limited to the player's jersey number. All autographs are on-card. 2012 Leaf Ultimate Draft is limited to 299 12-box cases. Love the thick card stock and the white back ground makes the player stand out quite nicely. If you are buying for the excitement of a hot rookie pull this is great because obviously it is all signed rookie cards. However, the bust potential is quite high as well if you are “investing”. I recommend taking a chance, the cards look and feel awesome. Leaf is Back on the scene. They have great cards for a VERY affordable price. Has great look feel. Signed Rookies always impress and a great product to start a young collector on IMO because of the cool pulls u can get, but for a GREAT price.